After a crew of thieves – including two corrupt cops – partially botch the robbery of a bank’s safety deposit box for Russian gangsters, the team are given another chance and their fee is withheld until she successfully steal more information, key to the release of the gang’s boss. The only way to pull off the heist is to distract all the local cops long enough for a decent window of time, and the corrupt officers Marcus (Anthony Mackie) and Franco (Clifton Collins Jr.) believe the best way to do this is to pull a “Triple 9”, to kill a cop. And they think they’ve got the perfect target in Marcus’ new greenhorn partner Chris (Casey Affleck), the nephew of prominent Detective Sergeant Jeffrey Allen (Woody Harrelson). Meanwhile, the thieves’ leader Michael (Chiwetel Ejiofor) receives grief from the Russian boss’ wife Irina (Kate Winslet), whose sister (Gal Gadot) is the mother of Michael’s son. The rest of Michael’s team is comprised of Russell (Norman Reedus) and his younger, unstable brother Gabe (Aaron Paul). 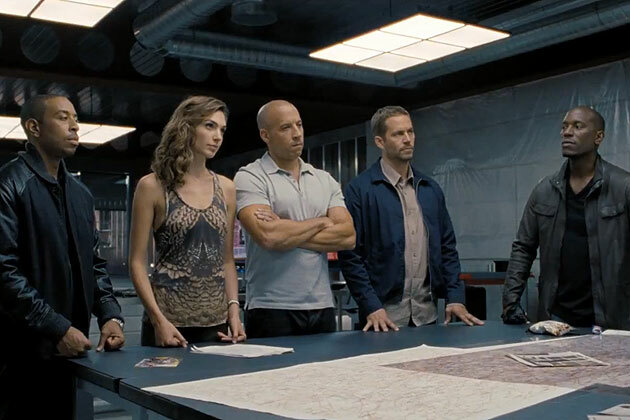 Former drag racer turned international bank robber Dominic Toretto (Vin Diesel) has given up the life of the crime and settled down with his new girl Elena (Elsa Pataky) after the death of his wife, Letty (Michelle Rodriguez). CIA Agent Luke Hobbs (Dwayne Johnson), who was last seen on the hunt for Toretto and his gang, shows up at Toretto’s home – not to arrest him, but to ask for his help, as Hobbs is now trying to arrest Owen Shaw (Luke Evans) and his team of master criminals and drivers, who are currently making Hobbs’ cops look like idiots. And apparently, the only way to catch an international thief with crazy driving skills and his similarly equipped team is to employ another set of international thieves with crazy driving skills. So why on Earth would Dom agree to help his former foe? Well, it turns out Letty may not have died after all, as Hobbs has a photo of her working for Shaw, so Dom calls up his team, and they set to work.